Fast and safe introductions of new textile products into operational production regularly provides textile finishers with challenges. The articles are introduced into production machines after a successfully-completed sample phase in the laboratory. In such cases deviations in the color and / or the colorfastness regularly occur, as do differences in the feel and volume of the textile products or changing appearances on the surface. Transfer of the functional parameters and settings from laboratory prototype equipment to the production machines are critical. This is because the machine types differ in equipment technology, in equipment design and in technical fittings. Pump sizes, liquor ratios, liquor volume, nozzle types and sizes generally differ very strongly in practice. The Thies development team has developed the iMaster mini (Fig. 01) with this background. The concept used in the iMaster H2O production machine, which is established worldwide, was consistently transferred to the iMaster mini. As a result, the results for the iMaster mini, which has a capacity of between 20 and 80 kg, are reproducible on the iMaster H20 production machine with its capacities of between 100 and 2000 kg. 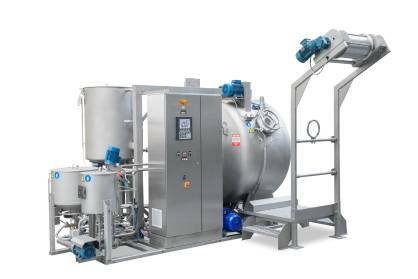 All wet treatment processes (pretreatment, bleaching, dyeing) in addition to efficient rinsing and cleaning processes at varying liquor ratios can be carried out. This enables flexible design of the treatment process and decreases the chemical consumption and the use of textile auxiliaries to a necessary minimum. Infeed of dyes and chemicals takes place with the aid of the Smart Dose System from Thies, as in the case of the iMaster H2O. Dosing of the products can be set precisely to individual requirements thanks to the use of user-friendly program technology. Further advantages of the Smart Dose System are the reduced dosing times and improved equalities. An additional tank fitted with a dry salt injector is provided for the addition of powdery substances such as Glauber salt. At the beginning of the batch the substance is manually filled into the additional tank. Transfer into the equipment takes place automatically without the machine operator having to intervene further. It should be underlined that the iMaster mini can be operated with the same nozzle types used by the iMaster H2O production machine. The nozzles can even be exchanged between the machines if required. The standard fittings provided on the iMaster mini also include the proven 100% batching tank (Fig. 02). The treatment used in the downstream process can therefore be prepared in parallel. The transfer time for a bath changeover reduces considerably, time savings of up to 22% can be achieved. An automatic filter system is fitted to the iMaster mini liquor circulation as for the iMaster H2O (Fig. 03). This continually frees the treatment liquor of fluff and contaminants. The filter is cleaned automatically. Process-related monitoring of the filter contamination was developed in this context. Automated detection of an increased degree of contamination in the filter basket initiates the cleaning process. Manual cleaning of the filter after or before every batch is no longer required. The iMaster mini can be operated with a filling capacity from a nominal 20 kg up to 80 kg. The machine's fully automatic loading adaptation enables this variability. The iMaster mini's functional scope can optionally be extended using all existing monitoring and measuring systems. All the extensions are used to analyze the processes more transparently and optimize them if necessary. Rinsing, washing and dying vats are measured online, analyzed continuously and presented graphically. If required the iMaster mini, and also the production equipment, can be fitted with the newly-developed T380 control unit (Fig. 04). This control unit processes complex functions and provides a web interface. The T380 is fitted with a so-called program designer (Fig. 05). Individual functions in the form of graphic elements can be quickly arranged using drag-and-drop to create a dyeing program. Further features in the new control unit include a high-resolution 12" touchscreen display in addition to a QuadCore processor and a Gigabit ethernet connection. An iMaster mini and an iMaster H2O are available for trials to all those interested in the company's technical center at the main office in Coesfeld. Comparison dyeing processes clarify the reproducibility between the two machine types. Furthermore, a range of possibilities for wastewater treatment, dosing and dye solution technology can be tested on site. The Thies company welcomes visitors at all times.